There are some places that you may have visited all of your life that just call for you to return year after year, season after season. That is the way it is with Lincoln Memorial Gardens, a beautiful park filled with Midwestern plants and wooded paths that is lovely during any season. Famous landscape architect Jens Jensen designed the gardens dedicated to the Land of Lincoln son, Abraham Lincoln. 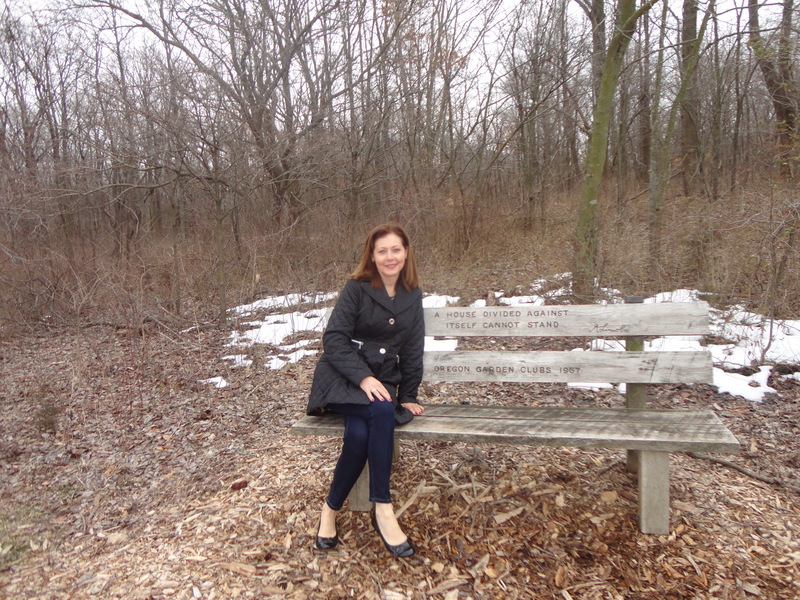 As you can see in the photo above, benches are scattered throughout the myraid of trails and all have a quote by A. Lincoln each thought provoking and of course down right honest. My friend Linda Spanberger (pictured in the photo) and I took a balmy day late in March and chose the garden for our afternoon walk. We enjoyed the benches, the campfire circles, chatting it up with the gardner in the public building and for me visiting the latest additional acerage for the first time. Linda who duirng her early college years lived near the gardens has particularly fond memories since her parents Larry and Betty Spanberger were both involved with the gardens and even have two trees donated in their names on the property. If you are near the Springfield area and looking for a peaceful, lovely walk, consider Lincoln Memorial Gardens, you will be glad you did. Previous Post: Ghost Tour St. Augustine Style!